Sometimes, you can feel it coming in the air of the night. Weather is fickle, but when a night of observing begins, we usually know how it will go. The first part of this season was often rainy and gray. The last several weeks, however, have allowed for new records in precision the precision of DECam data. On Nov 11 and Nov 18, 2014, the Dark Energy Survey took exquisite data of all of our supernova fields – the regions of sky selected specifically to look for exploding stars. It was clearer than anything we’d seen previously. The video above is from a night early in this season, when the weather was also extremely good (but only for a few days). It is a view, from inside the dome, of DECam and the Blanco Telescope scanning the sky over the course of one night in August, 2014. After a few nights of clouds or rain, it usually takes another night or two for the atmospheric turbulence to die down. This turbulence deflects light as it comes through the layers of Earth’s atmosphere, effectively blurring an image. But when this turmoil is no longer there, the conditions can be pristine. Sometimes, you can feel it coming in the air of the night. It’s the final moment for so much starlight. We are here to see what it did, see it with DECam’s 570 million eyes. DECam’s been waiting for this moment all of its life. Now we know where you’ve been, traversing the dark night skies. The light of distant galaxies and stars has been waiting for this moment all that time. Now forever, we remember where the light has been, how could we forget. When our detectors capture it, it’s the first time, the last time, we’ve ever met. We know the reason you kept your silence up. When it was cloudy, how could we know. When it’s clear, the signal still grows, the universe no longer a stranger to you and me. Sometimes, you can feel it in the air of the night. For the last week, detectives from the Dark Energy Survey have been coordinating across four continents to bring to light more evidence of how the fabric of spacetime is stretching and evolving. In Sussex, England, over 100 detectives met to discuss the current state and the future of the Survey that is conducted at the Blanco telescope, located at Cerro Tololo in Chile. At this semi-annual collaboration meeting (with a new venue each time), we continued to strategize analyses for the many probes of spacetime evolution and dark energy: as I write, several early results are being prepared for publication. At Cerro Tololo, a team of observers operated the Dark Energy Camera (DECam) on the Blanco telescope, as we make our way through the second season of observing for the Survey. Each season goes August through February, during the Chilean summer. The Anglo-Australian Telescope at Siding Spring Observatory in Australia is home to the OzDES Survey – long-term project for obtaining highly precise distance measurements of objects discovered by DES, such as supernovae and galaxy clusters. These “follow-up” measurements will be very important evidence in pinning down the culprit for dark energy. At Cerro Pachon, just east of Cerro Tololo, another team of two agents began to search for evidence of highly warped space in the distant cosmos, using the Gemini (South) Telescope (@GeminiObs). We spent six nights working to measure highly accurate distances of strong gravitational lensing systems. These systems are galaxies or groups of galaxies that are massive enough to significantly distort the fabric of space-time. 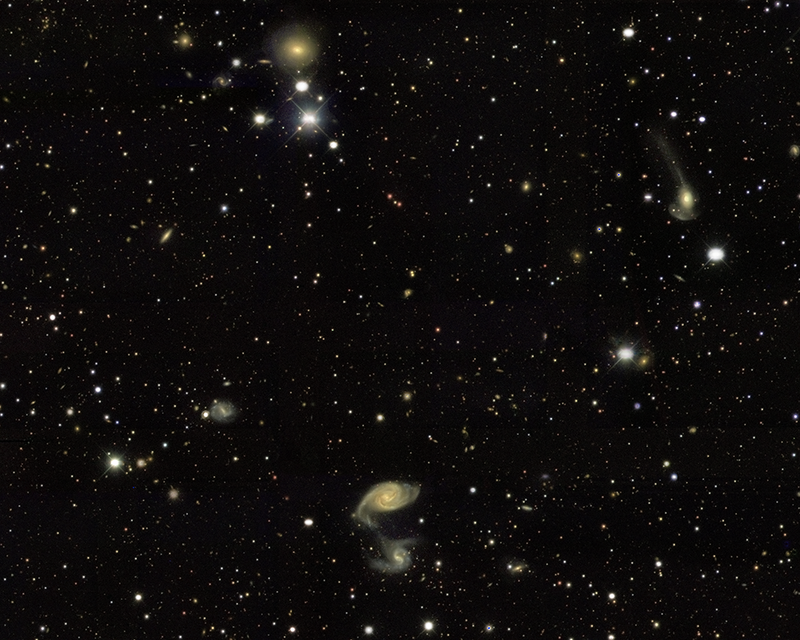 Space and time are so warped that the light rays from celestial objects – like galaxies and quasars – behind these massive galaxies become bent. The resulting images in DECam become stretched or even multiplied – just like an optical lens. In future case reports, we’ll expand on this phenomenon in more detail. All the while, supercomputers the National Center for Supercomputing Applications (NCSA) are processing the data from DECam each night, turning raw images into refined data – ready for analysis by the science teams. The image above doesn’t display any obvious strong lenses, but it is an example of the exquisite lines of evidence that DES continues to accumulate each night. 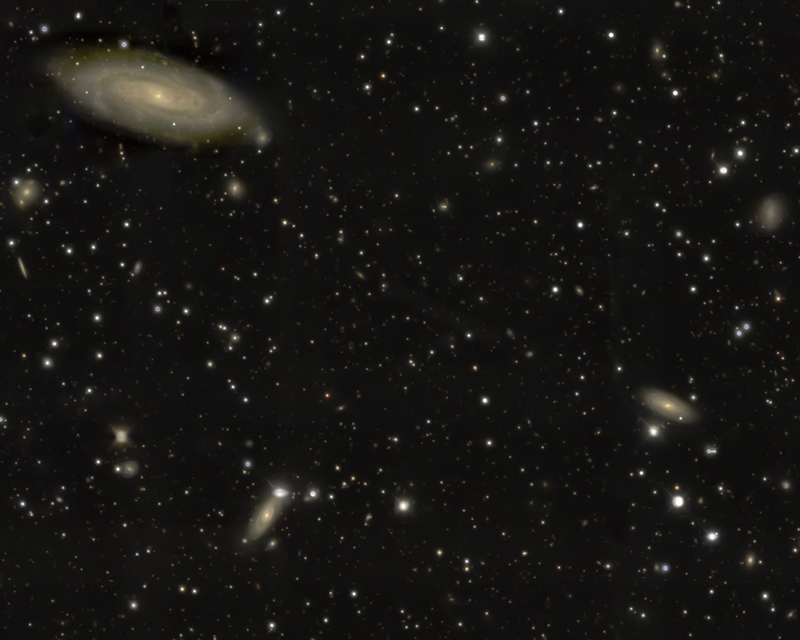 Here are positions of some of the galaxies above. What information can you find about them? There are several electronic forensic tools to assist your investigation (for example, http://ned.ipac.caltech.edu/forms/nearposn.html; take care to enter the positions with the correct formatting, as they are below). Tweet your findings to our agents at @darkenergdetec, and we can compare case notes. Across North America, as the transition toward winter begins, we see symptoms in the changing colors of tree leaves. The lively green hue of summer gives way to yellows, oranges, reds and purples. Living cells inside the leaves have instructions for how to react to cooler and cooler environments: this reaction reduces the production of the green pigment, chlorophyll, allowing other colors (caused by the pigments of the carotenoids and anthocyanins) to dominate. When spring returns, so do leaves, newly filled with oxygen-producing chlorophyll. Year after year, we watch the cycle of death and rebirth in the life-giving foliage around us. But what if we were insects? What if, like the mayfly, we lived for only a day or two? Would we have any way of understanding the immense tapestry evolving around us? Imagine for one day on Earth, looking at leaves all over the globe – in different environments and in various states of health and age. With just this one day to create a coherent picture, could we piece together the clues of color, environment and the internal workings? This is the challenge we face in understanding the life-cycle of galaxies, the leaves on our cosmic tree of matter and light. To these celestial objects, we are indeed the mayfly, living for only a blink of an eye in cosmic time. Consider the cornucopia of dusty swirls in the image above, their colors spanning the entire visible rainbow and beyond. Each puff of light contains billions of stars. Through our telescopes, images and spectrographs, we learn about the kinds of chemicals, of matter that reside within galaxies. Through an understanding of physics, we link this information to the possible physical processes, from gravity to quantum mechanics. Similar to that of tree leaves, the colors of galaxies are the result of the chemical constituents, and they reflect their ages. Blue galaxies, still young, are cold enough to be forming stars, because young stars and the gas enshrouding them release bluer light to the cosmos. Red galaxies have had their star-formation extinguished: their gases are too warm for the force gravity to collapse them into energy-generating balls of fusion. These ‘red and dead’ galaxies represent the end of the galactic life-cycle. While we have ways of peering inside galaxies to reveal some of their guts, we still have no way to watch an entire galaxy come into being, much less live out a full life. Each galaxy represents its own tributary of time, its own puzzle piece in the delta of the cosmic web. As the Milky Way sets, light from nearby villages and mining towns turns the stream of clouds overhead into a rippling river of fool’s gold. On this night in October of 2013, during the first season of observations of the Dark Energy Survey, we pumped caffeine into our bodies to stay awake, to keep ready for when the conditions would change. Every field we can observe, every galaxy we can capture will make a contribution to the greater measurement of their vast patterns – patterns distorted (or created) by a dark energy. One hundred years ago, an American astronomer by the name of Vesto Slipher became the first to measure streams of galaxies in our local neighborhood. Slipher used the 24-inch telescope at Lowell Observatory to measure velocities of spiral nebulae (i.e., galaxies), through a method known as “spectroscopy.” Most of the galaxies that Slipher measured are receding from the Milky Way, rather than moving toward it – the first indication of cosmic expansion. This result laid the groundwork for the definitive discovery of the expanding universe. Unfortunately, Edwin Hubble of Mount Wilson is most often accredited with this finding. Hubble measured distances via Cepheid Variables to distant nebulae and then correlated them with Slipher’s velocity (redshift) data to create the famous distance-velocity plot for his 1929 paper. Hubble provided no citation of Slipher’s work. Slipher is the first to measure Doppler Shifts (velocities) of galaxies, to show that spiral galaxies rotate, and to detect that collections of stars and dust are actually nebulae outside our own Milky Way. Let us remember Vesto Slipher – among modern cosmology’s most influential unsung heroes.